So by now I should have had the baby. Today is Sunday and I am writing this right before I have the baby. So basically I am telling my future self that I made it and survived the end! ? This last day before I have the baby feels like the hardest. It was so hard to sleep last night and it is even harder walking on my swollen feet. I am sitting in our theater room lovesac because thats the only thing that is comfortable right now. But I feel so much excitement for the baby to get here and I can’t wait to see her and see what she looks like. So here is the thing. I am going to be taking some time off to enjoy the baby. So I have been working hard to keep the delicious meals coming and scheduling out so that I can unplug from the entire world and enjoy every second with my last baby. Not only do I have posts lined up for you, my contributors are continuing to bring you amazing recipes. So don’t you worry. I would not leave your family hanging and hungry! Ha! Delicious mouthwatering recipes will still be coming your way! Like this one. 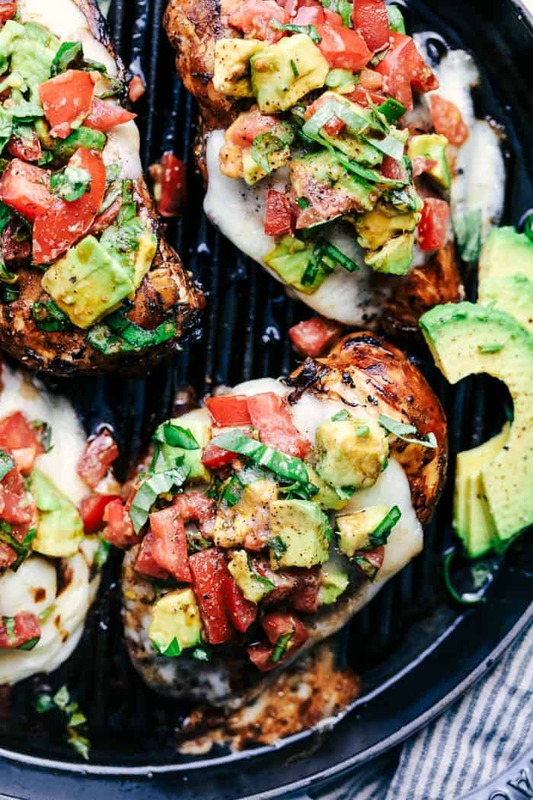 I could not wait to share with you this Grilled California Avocado Chicken! First of all, this chicken marinates in a honey garlic balsamic sauce. I mean who doesn’t love that flavor combination? It marinates to perfection and honestly grills to tender and juicy perfection! The flavor is absolutely unreal in this chicken. 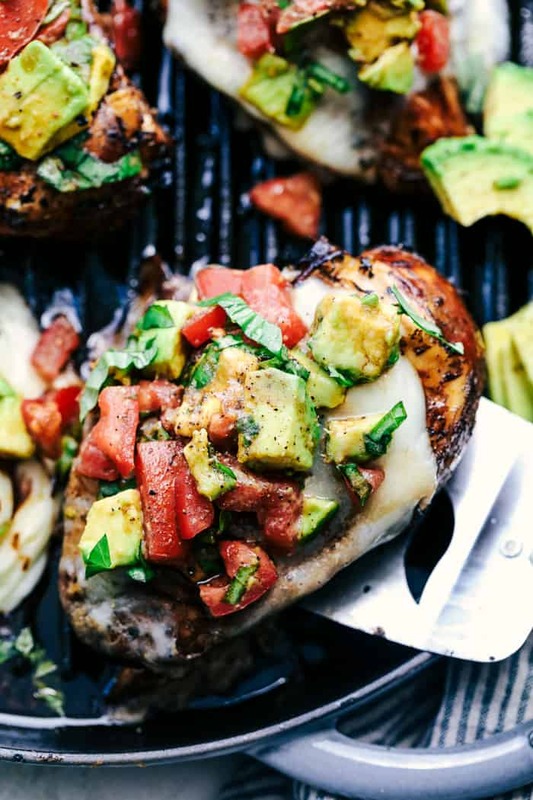 And just when you think that it can’t possibly get any better, you top it with a thick slice of mozzarella cheese when it comes off of the grill. It gets so melty and ooey gooey. 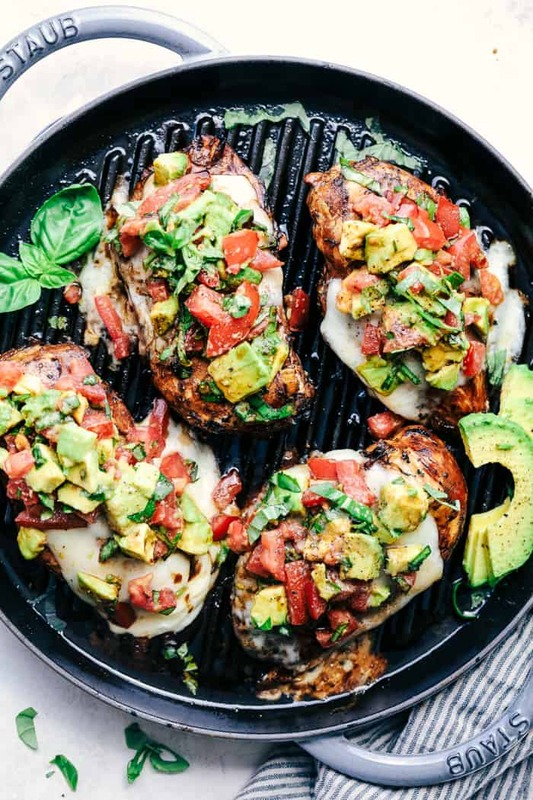 And JUST when you think it can’t get any possibly better with the ooey gooey cheese on top comes the avocado, tomato, and basil. 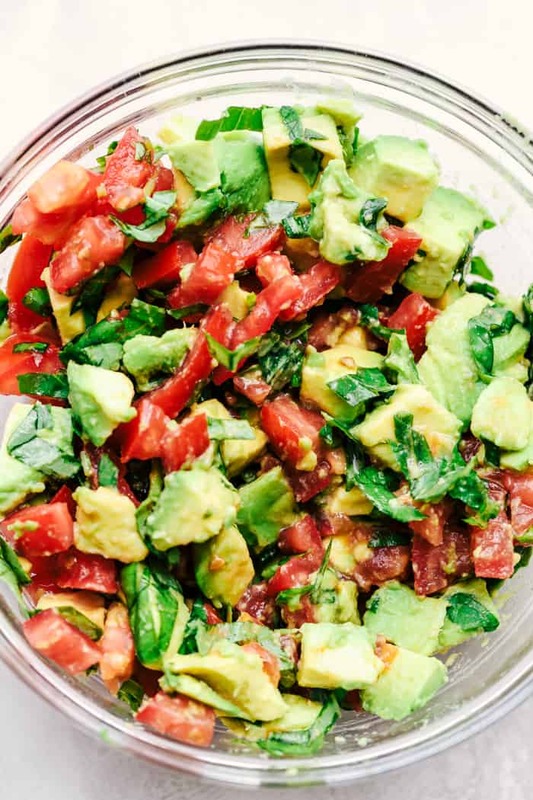 Que all of the heart eyes for the avocado, tomato, and basil combination. ??? My mouth was watering making this to top off the chicken. It provides a fresh and delicious element to the top. It also makes it vibrant and delicious and such a pretty presentation. My family couldn’t wait to devour it! I am telling you. This was one of the best things that I have ever thrown on the grill. I already can’t wait to make it again. The flavors came together so well and I know that this will become a family favorite at your house as well! I cant wait to try this! The balsamic you added at the end looks thickened….what kind is it? Thanks! My 14 year old son and husband ask for this weekly! So glad I found this website. We have tried many recipes and they are all keepers. Do you have Nutritional information per serving? What is a good side with this? Making tonight and wondering what to cook with. Thank you! We made the chicken for dinner last night. Let me just say that my niece’s husband wanted to lick his plate. This is so delicious and so easy. Thank you for sharing. Made this last night…..it was Aaaaamazing.! Thank you for sharing. 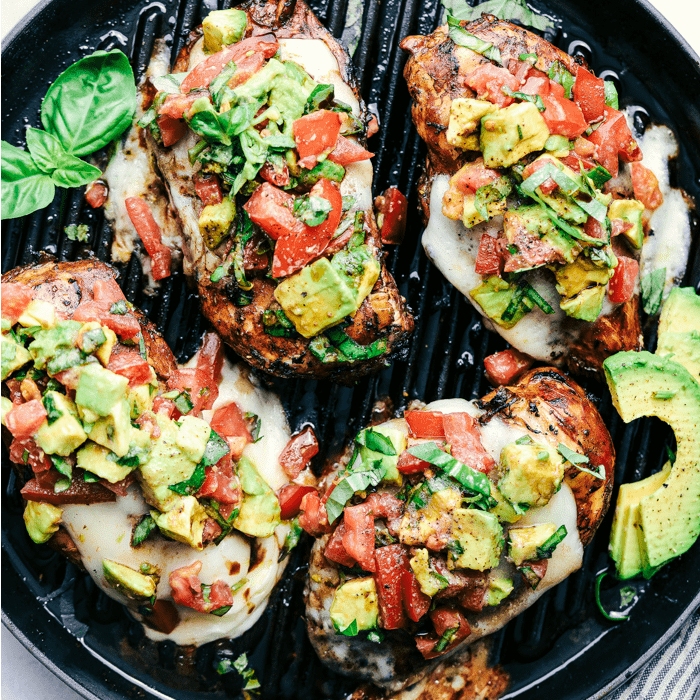 How do I enter California grilled chicken avocado recipe in My fitness pal app? Ok recipe but the cheese adds no value except to make increase risk of heart attack. Cajun spice or peri peri with avo salsa would be better. Oh my GOD !!! This recipe was off the hook. I made this for my mother in law, my wife and myself and let me tell you what !!! OH MY GOD we LOVED it !!! And I am not a balsamic vinager guy. What a nice change to the usual chicken recipe. This is definitely going in my favorites. I did cut the breasts in half long ways and it was unbelievable. 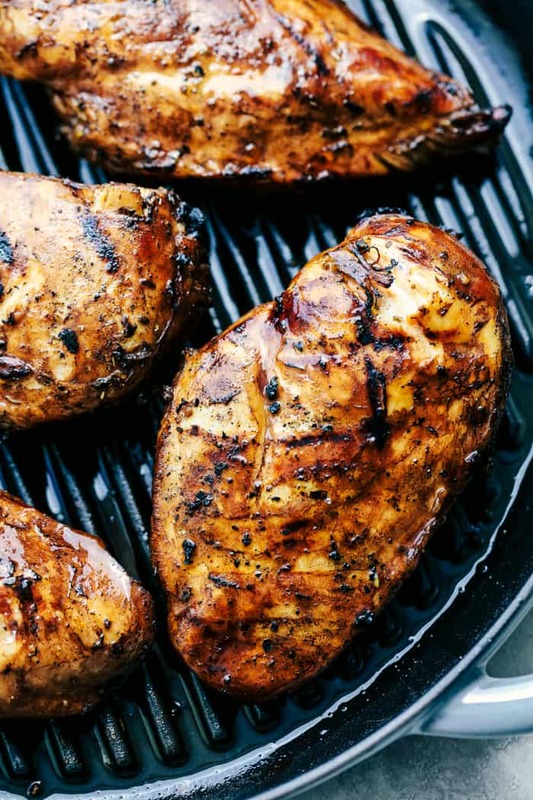 I cannot wait until summer so I can make the chicken on the grill. I just finished making this for dinner tonight. It was excellent. The aroma from balsamic chicken is still hanging around maki g me just want to keep eating….thanks for the recipe….